It is amazing what Sky Map can do by combining GPS, motion sensors and a large database. Once you download and install Sky Map from the Android Market you can get started. 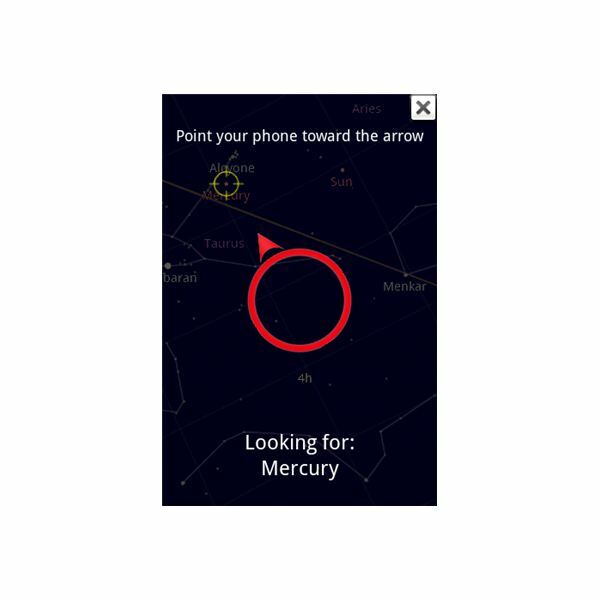 With Sky Map, you can point your Android equipped smartphone toward the sky and, using GPS location, be presented with a screen that shows you the names of the brightest objects overhead. You get a view of the sky based on where you are located, time of year, time of day and the direction you are facing. The image can be rotated in 45 degree increments. Alternatively, you can enter the name of a planet, or other object, and the system places a cursor on the screen that directs you to the object. By moving your phone in the direction of the arrow, you try to line up the circle over the object. As you approach the object the arrow changes from blue to red. [It is reminiscent of the game I used to play as a child. We would look for a hidden object and be told warmer as we got closer to the item or colder when moving away.] Once you are aligned with the celestial body you are searching for the cursor turns red and the application circles the body for you. Even though the features are relatively simple to access there is one aspect that seems tricky for most to master. The automatic mode navigation can be challenging but, with practice you should be able to master this feature as well. The potential frustration of learning the controls is readily overcome by the fun and enjoyment of working with the application. You may be surprised at the serindipitus discoveries you make while getting a handle on things. 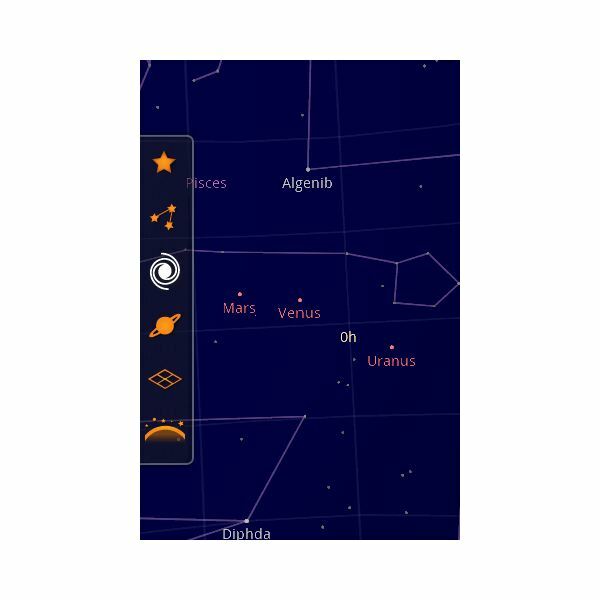 The features of Android Sky Map include a search function to find stars, planets and constellations. You can use the automatic view to allow the app to update the map for you or you can switch to manual mode and use your finger to drag the map as needed (requires a touch screen equipped device). The functionality of a compass, motion dector with accelerometer and GPS allows the display to update as you move your hand. Celestial objects are readily identified with the map showing the brightest objects (visible with the naked eye) with the horizon, cardinal points and Messier Objects. Constellation lines are also provided to help with identification or to show someone what stars make up a constellation. This is helpful for teaching those who have a difficult time visualizing those features. Google provides a mobile blog site to provide the latest information on Sky Map.